The data-analytics application works in conjunction with the smart pump system to create a continuous quality loop to strengthen patient safety, opportunities for improvement, and data-driven insights. There are numerous reasons patients stop taking medication against their physician’s advice. They might feel better (or, thanks to side effects, feel worse). They might not be able to reach the pharmacy. The cost might be too steep. Then, of course, there is the potential for medications to be prescribed from a number of points of care, which is leading to more challenges regarding medication reconciliation. Whatever the cause, poor medication adherence has significant costs for both the individual and the health system. Treating less sick patients at a tertiary hospital is usually not cost-effective compared to a community hospital setting, and treatment of complex cases at the community hospital often produces less favorable outcomes that are not in the best interests of the patient. 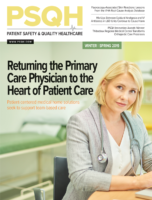 Five years ago, PSQH spoke with Jeanette Ives Erickson, RN, DNP, FAAN, about a new and exciting innovation in her hospital, Massachusetts General Hospital (MGH) – an initiative that designated 12 Innovation Units, where a philosophy of relationship-based care and 13 evidence-based interventions could be safely tested. This March, we checked in to see how the initiative has fared.